Note: This story contains reference to school and gun violence. As the principal and I watched the heavy machinery level the last of the dilapidated portable classrooms, an idea flitted across my mind. On a whim, I asked if a portion of the land being cleared might be set aside for Science purposes—perhaps a garden? 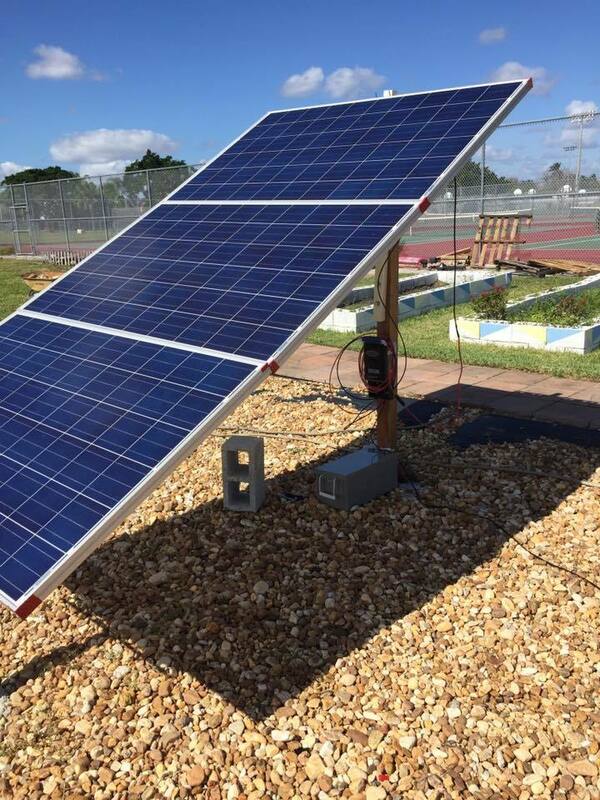 After considering the proposal for a few days, Mr. Thompson generously offered the Science Department an elongated strip of land adjacent to the tennis courts. Not expecting to receive such a large tract (~ 9,000 sq. ft.), I began to sketch out the basic layout of what would become "Marjory's Garden". 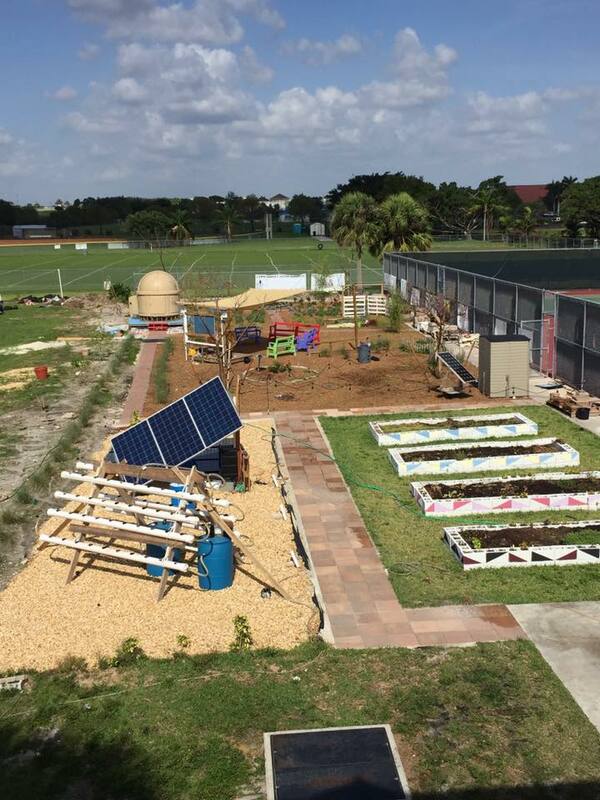 The environmentalist Marjory Stoneman Douglas was 100 years old when her namesake school opened its doors in 1990 (she lived to be 108!). Her influential book, The River of Glass, established her as a champion of the Everglades. 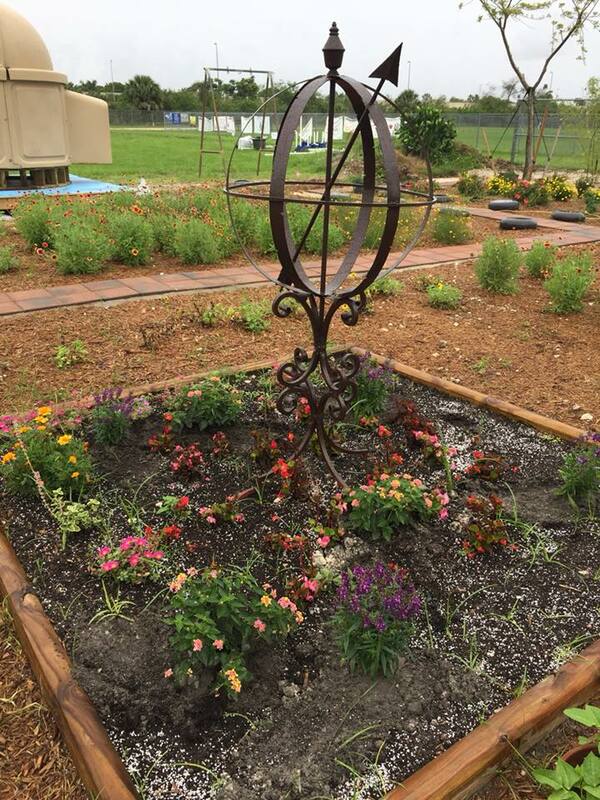 Accordingly, science teachers such as Tammy Orilio wanted to ensure from the start that the garden reflected her values. We also wanted the garden to be a place of learning. 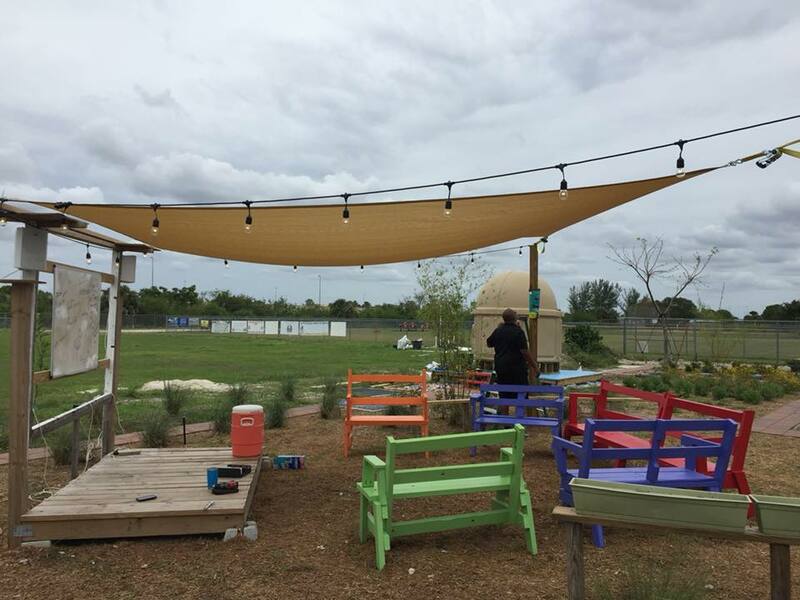 In May of 2016, the PTA voted to give us $1,000 to get the project off the ground and the Marjory's Garden project took its first, tentative steps. Allow me to confess at this point that, at that time, I knew absolutely nothing about gardening! The last time I had planted anything was the tree sapling I brought home on Arbor Day in the 5th grade. I am, however, a believer in adopting a growth mindset and this presented a challenge on a much larger scale than anything else I had ever attempted. I am also a major proponent of project-based learning. My colleagues Mr. Sean Simpson, Mr. Frank Krar and I had been conducting a high-altitude balloon project, Project Aquila, since 2010, and had witnessed the positive benefits of hands-on learning. We made it a priority to allow students a high degree of freedom in decision-making, and we put digital and physical tools in their hands, and under their control, as often as possible. This created an enormous degree of buy-in on their part and that, to me, is what makes that project successful year after year. We agreed that the garden would operate under those same norms. The months ahead were filled with small triumphs, and frustrating setbacks, but progress was steady. We received grants and donations and much-appreciated help from parents and community members. By December of 2017, we had even added some lighting and began holding both my "Astronomy Nights" in the Garden, as well as "Full Moon Yoga" (courtesy of our amazingly devoted yoga teacher, Amy Kenny). As 2018 dawned, I began to prepare for my ten-year National Board re-certification. As part of the process, I recorded a video tour of the garden on a Saturday morning when it was abuzz with activity. I had never been happier with the project—we had a couple dozen students hard at work on various tasks, as well as several adult advisors present to supervise. One student, under the guidance of Mr. Simpson, is seen constructing a small aquaponics system of his own design. 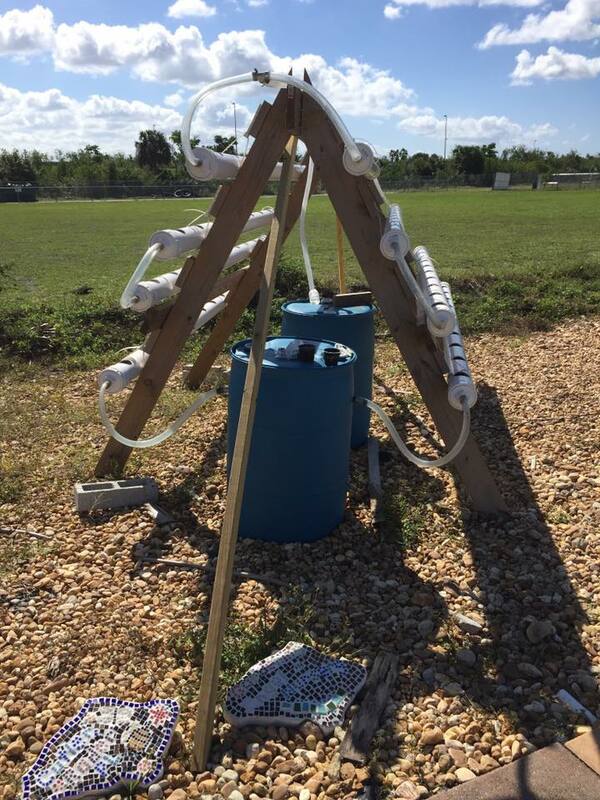 That student, an intense and highly intelligent young man named David Hogg, had become a leader in many of our STEM projects, but he reserved his greatest passion for Marjory's Garden. The date was February 10th. Valentine's Day began for me in the garden. About a third of the garden wasn't being irrigated properly, and I arrived early that day to tentatively lay out some PVC pipes and sprinkler heads. I figured the construction of new irrigation lines would provide a nice project for our students later in the week. Just before the first bell rang, I entered my classroom and glanced at the new wooden bench that Mr. Tracey’s engineering class had just delivered for us. Having picked up some bright green exterior paint the night before, I asked for a volunteer to paint the bench after the day’s lecture. As usual, my first hour class of seniors wasn't quite fully awake it seemed, and only a single hand went up. That hand, not surprisingly at all, belonged to one of my most creative and enthusiastic and brilliant students—a young lady named Emma González. (Note: if you see the green bench in Marjory’s Garden, please know that it is now, and forever, ‘Emma’s Bench’). About twenty minutes before the final school bell that day the fire alarm went off. Having had a drill earlier in the day I assumed that someone from facilities had either accidentally triggered the alarm, or that a student had pulled it in hopes of going home early. My 4th Hour class casually shuffled out of the classroom. As the last student crossed the threshold, however, a more urgent call of “evacuate the building” came over the intercom and an inkling of concern crept into my mind for the first time. Over the next couple hours that concern metastasized, revelation by horrifying revelation, into a nightmare of unthinkable proportions. 17 dead. 17. I had already walked to my son’s school and picked him up when that unimaginable number darted across a text alert on my phone. My heart stopped. Our school, where my daughter had graduated and where my son would soon attend, was going to be a Columbine, a Sandy Hook, a Virginia Tech . . . The first few days of the aftermath are a blur to me. I hadn’t cried that often, or incessantly, since 9/11. But the profound sadness of this tragedy was more personal this time and managed to cut even deeper. My emotions toggled between sadness and anger and even guilt. I was addicted to the news and began seeing my colleagues and students filling the airwaves. I couldn’t sleep, and the fact that I live across the street from the school didn’t help. At least three helicopters hovered overhead day and night. Dozens of media trucks and trailers literally blocked the entrance to my community. I spent each evening attending candlelight vigils and trying to comfort my grieving students with the offer of a hug or a shoulder to cry on. But it didn’t seem like I was doing enough. A nagging feeling was growing in my heart that I needed to do more. Then I remembered the garden. No one was tending it. It hadn’t rained that week and the plants needed watering. At least now I had a small, but tangible, mission. I woke just before dawn and walked with purpose toward the school. I slipped through the now-slumbering media circus, and even through the first layer of security, without a hitch. But the security layers intensified as I passed from local to State to Federal officials. After a brief negotiation with the FBI, I was finally allowed brief access to the garden. Having been a teacher at MSD for 24 years, just over half my life, I didn’t think it possible for me to feel like a stranger at my own school. But I did. At least until I reached the garden. There it was, beautifully green and remarkably untouched by the surrounding chaos. I felt like I was in the eye of a tremendous hurricane swirling around me. But there in the garden it was peaceful, and quiet, and blessedly tranquil. For the first time in days I felt a sense of normalcy. I sat on our modest classroom stage and watched the rising Sun’s rays illuminate our little oasis. And in that moment, I found my purpose. We were going to finish building the garden, and we were going to make it better than ever. We were going to create a welcoming place for our students and staff to hopefully discover the same sense of tranquility that I was relishing at that moment. My mission was clear. The next few days were spent by many of us attending visitations and funerals—each its own tragedy, each an incalculable and senseless loss. There were so many scheduled that we had to pick and choose which to attend. One of our most devoted garden students from the previous year had lost his beautiful and talented sister in the tragedy. That visitation was, it goes without saying, heartbreaking. They all were. The first day back at school for the students was one of the most difficult days I’ve ever experienced as a teacher. What do you say to students who watched their friends die next to them, or hid in fear during the chaos, or who lost their coach, or their teacher, or their sibling? One of my students, a quiet, smart, and kind young man, lost his younger sister. Another was badly injured (thankfully, she has recovered remarkably well). Someone in our department suggested that the students paint rocks the first couple days back as a kind of therapy. Lessara’s Nursery, who had supported us in the garden previously, contacted a rock quarry that donated half a ton of river rock for that purpose. Orchard Hardware then donated a dozen gallons of exterior paint. Most of those beautiful rocks eventually found a home in Marjory’s Garden. One of the most effective sources of healing came from the therapy dogs that began populating the campus. As you can imagine, the dogs loved to be in the garden! That alone began to draw classes into the garden, including my own. We had installed Bluetooth outdoor speakers that allowed us to listen to music. We even had a bean bag toss set to provide entertainment. As more classes began enjoying the garden, including those permanently displaced from their room in the 1200 building, I was just thankful that students and staff had such a place to go. The amount of support that began flowing into our school from around the world was dizzying. Several staff members were busy every single day sorting letters and gifts and banners lovingly donated to the school. The Florida Landscapers and Nursery Growers Association donated seventeen beautiful trees that now line Holmberg Road adjacent to the school. Offers of help also poured in concerning the garden. 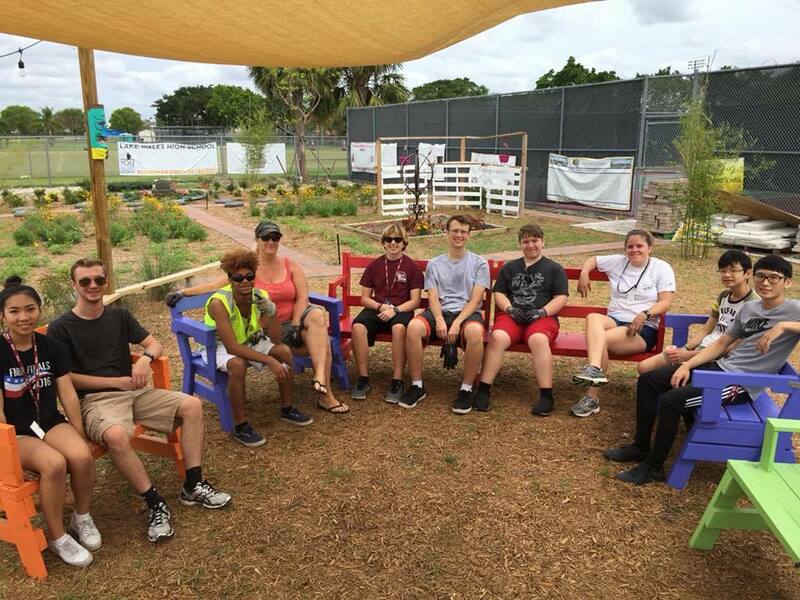 A landscape company, BrightView, met with our wonderful student Garden Club officers, including our President Lexi Smith, to develop a plan to develop some of the unused portion of the garden space. They sent an entire team in April, as did another company, All County Paving, to help make that plan a reality. The students donned BrightView work vests and worked alongside the professional landscapers all day long. It was an amazing transformation! 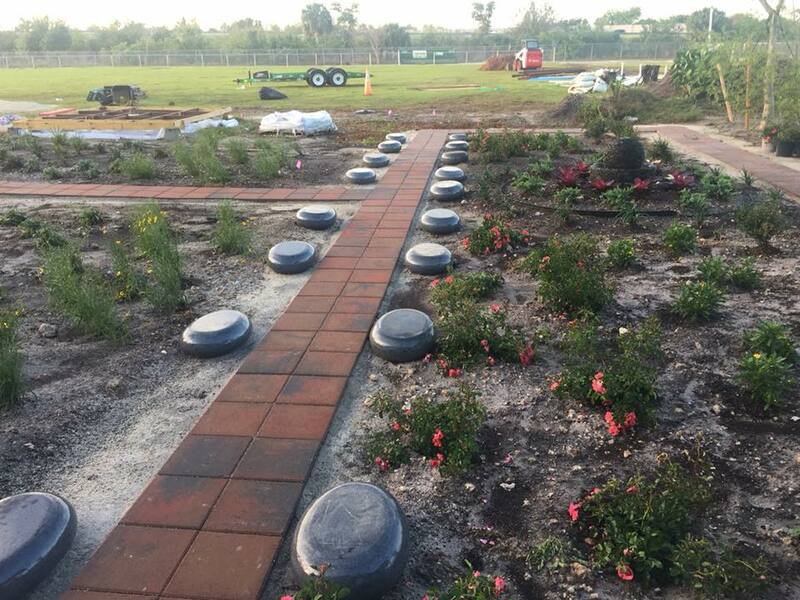 We planted four large gumbo-limbo trees, bamboo trees, and hundreds of plants native to Florida. They even built a “reflection garden” centered on a small fountain surround by beautiful, Mexican river rock and bromeliads. New sidewalks were added as well. 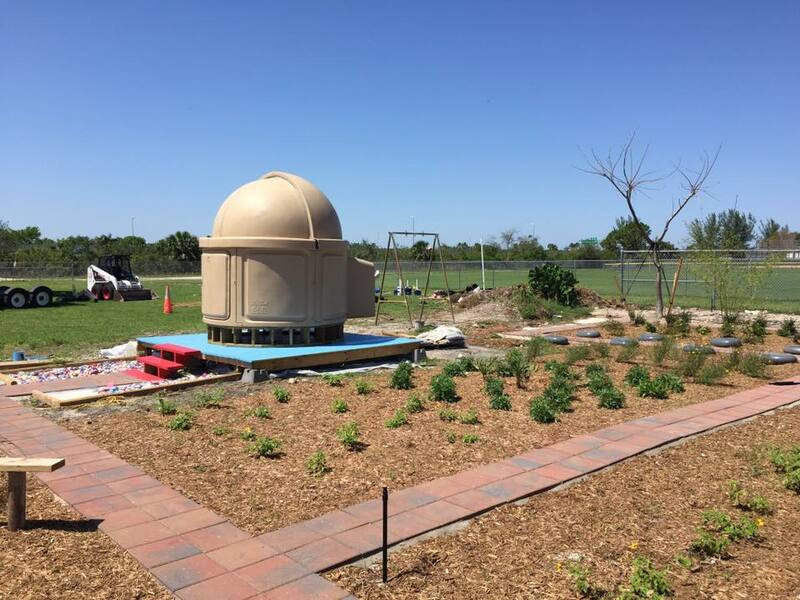 In the weeks that followed, my students and I also completed a project near and dear to my heart—the Observatory at Marjory’s Garden. 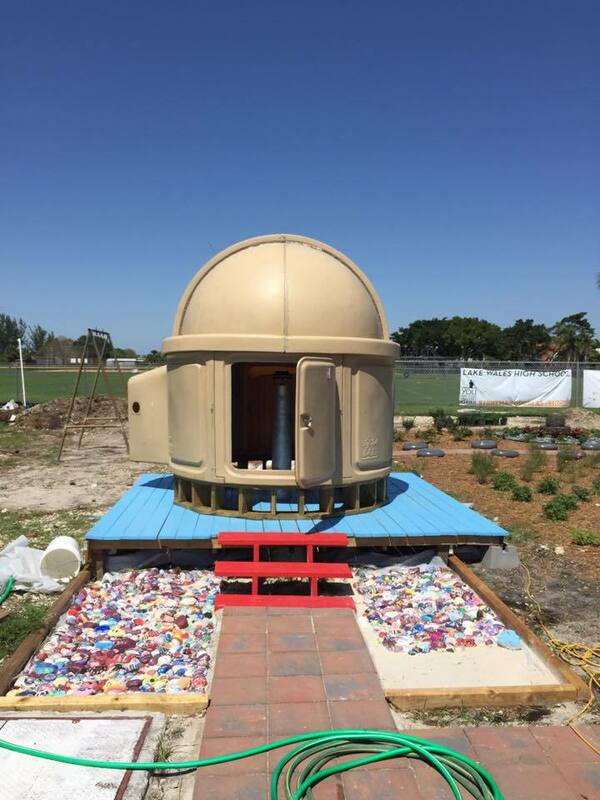 We had purchased a small, plastic dome from a local amateur astronomer in January and spent most of the Spring completing the deck that supports it, along with a concrete pier to support a telescope within. Oh, and the painted rocks mentioned earlier made for nice, colorful rock gardens nestled on each side of its entryway. 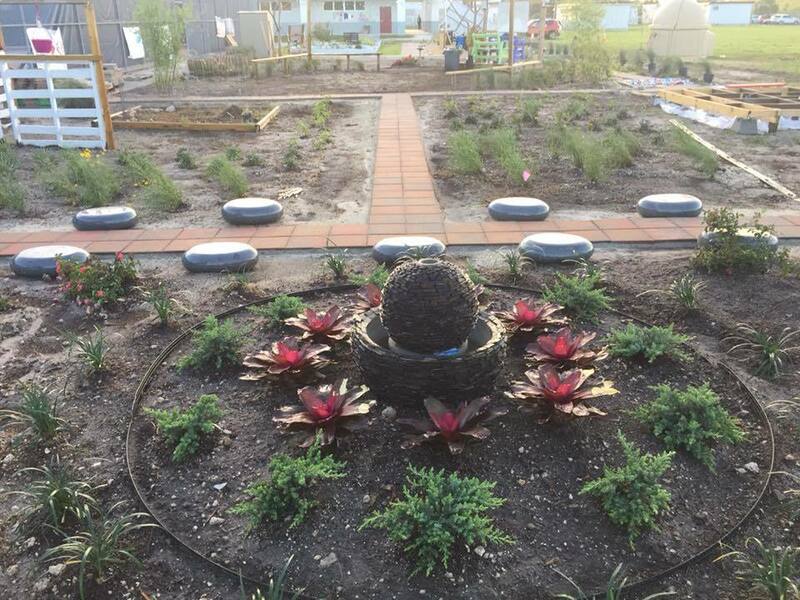 As the school year mercifully came to a close, I felt like Marjory’s Garden was not only beginning to fulfill the purpose envisioned for it two years before, but much more . . . I grew up in rural Southern Illinois where a small, wooded area formed a seamless extension of our family home’s spacious backyard. The hours my friends and I spent in that backyard, and exploring those woods, were some of the happiest memories of my childhood. I don’t claim to understand all of the anxieties and pressures that young people are dealing with today, and I can’t claim that access to sunshine and greenery and fresh air will solve every difficulty that they face in life. But I know in my heart that such green spaces are important, and necessary, and make our schools and communities stronger and healthier and more vibrant. They are pockets of positivity in a world that is far too often negative, divided, and, sadly, violent. I believe that if just one young person turns away from violence, or suicide, or opioid use because they have a shovel in their hand, or flowers to plant, or vegetables to harvest, or even stars to gaze at, then it was worth it, as a society, to have provided them with those opportunities to interact with nature . . . and with each other. That’s my hope for other schools and communities throughout our great country, and that’s my motivation moving forward with Marjory’s Garden.